When you are ready to open your first bank account, the financial institution that you choose will have a huge influence on how you manage your money and the positive impact you can have in your local community. Here’s a fun look to see how credit unions, banks, and even your piggy bank stack up! Thank you 7000 times over! During these busy and globally turbulent times, we wish to pause to give thanks to the many generous community members, volunteers and sponsors who have contributed to the First Credit Union & Insurance Secret Santa program over the past fourteen years. The Secret Santa program was designed to support children and families in the community that would otherwise go without gifts during the holiday season. Since its inception in 2001, a startling 7,000 presents have been distributed. This year, it is expected that through the public’s generosity, over 500 children in the Comox Valley alone will be reached. Many of the First staff and community partners have been with the program since the beginning, collectively donating approximately 1000 volunteer hours annually. Those involved speak about the opportunity to bring happiness and comfort to those struggling and less fortunate or those experiencing an unexpected crisis or challenge. “Some of the most heart warming and memorable Christmas wishes are those that were the most modest: not flashy toys or sophisticated electronics, instead, things like warm winter boots or new bedding”, says Pamela Jolin, longtime staff member and program coordinator. For the 2015 season, trees will be located in all First Insurance offices, Westview Agencies office, Ascent Physiotherapy, Courtenay Family Chiropractic & Orthotics, Cumberland Dental, Dairy Queen, Driftwood Dental, Fitness Excellence, FYidoctors, Glacier Greens and First Credit Union in Cumberland and Powell River. Community members who wish to purchase a gift for one of these special children can currently pick a tag off any tree, go shopping and then return the unwrapped gift to the same location or any of the First Credit Union & Insurance offices or Westview Agencies office by Monday, December 14th. For those unable to shop, cash donations are also gratefully accepted and volunteers will purchase a gift on behalf of the donor. Registrations for the First Credit Union & Insurance Secret Santa program are being accepted now until Monday, December 1st, 2015. Forms are published in the Comox Valley Record or can be obtained at one of the First Credit Union or First Insurance branches in the Comox Valley. For more information, residents can call First at 250-703-0858. Kings player, Jeff Smith, reading to Westview Elementary students. Our local Powell River Junior A Kings Hockey Club is a winning team, and I’m not talking about the number of games they’ve won, or their game point average. I’m talking about the work they do in our community – teaching kids to skate, taking them trick-or-treating, volunteering on the ORCA bus, participating in the Christmas parade, building Christmas hampers, serving food at the Assumption Soup Kitchen, manning Salvation Army Christmas Kettles – and my favorite of all – participating in the Westview Agencies READ program. Every Monday, from October to February, Powell River Kings players put down their sticks and pick up their books to read with children and promote the importance of reading. Over 1,500 students in eight local elementary schools participate in the annual READ program. Partnerships like these are what makes the work we do at Westview Agencies, First Insurance and First Credit Union so worthwhile. Thank you Kings for being such great partners and ambassadors in our community. You are truly a winning team! 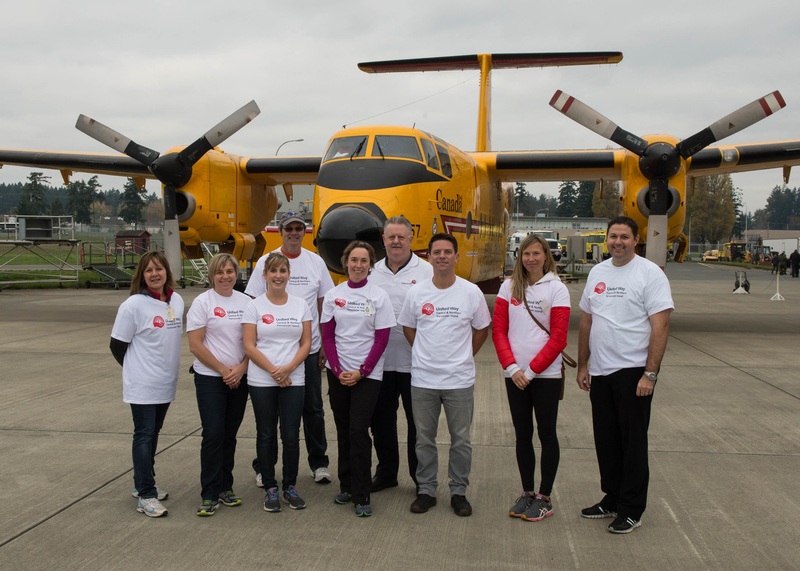 On a cold Friday morning in October, a team of United Way members joined over 100 staff and military of 19 Wing Comox to pull a Buffalo Search and Rescue plane 40 feet as fast as possible. I had no idea what to expect when I was asked to participate, but what I experienced was truly amazing. It was a grueling task, even with the assistance of several base staff and military personnel. Regardless of the pain in our legs and lungs, it was an incredibly rewarding event to be involved in knowing that all the funds raised from our efforts would stay in the Comox Valley. Also, it was uplifting to witness the spirit and dedication by so many to this organization and community. First Credit Union Branch Manager for the Comox Valley, Craig Keeping, has been a cabinet member with the United Way for over three years. He describes his commitment to the charitable organization a natural fit due to how our company values align with theirs and our shared commitment to investing in our communities that we serve. To learn more about the United Way, visit them online: http://www.uwcnvi.ca.